Most of us pay little or no attention to salt & pepper. They don’t cost much and are easily obtainable at any grocery store. Every household has a container of salt & pepper on the table or in the cupboard, but it wasn’t always this way. At one time, both salt and pepper were literally worth their weight in gold! Modern salt mining techniques and expanded pepper growing regions have made them an everyday item rather than a luxury. Shaker sets come in all shapes, lengths and sizes. The use of salt and pepper at the table came into being sometime in the Middle Ages in England. Salt was typically served in a small bowl or container , usually with a spoon, because it had a tendency to attract moisture and become lumpy. These early “salt cellars” were made of pewter, horn or wood, but by the 15th century, cellars were ornate and elaborate pieces made of silver or gold and studded with precious gems. Pepper never suffered from the same susceptibility to dampness but, like salt, it was also served from a small container. Many people believe that the salt shaker was invented by John Mason around 1858–the man who invented the Mason jar. His shaker evenly distributed salt on food, just by shaking it through the holes punched in its tin cap. The salt still became lumpy and the Mason shaker was short-lived. Fifty years later, the Morton Salt Company of Chicago added magnesium carbonate to the salt, which prevented lumps and caking from moisture, making it possible to pour from a closed container. “When it rains, it pours” was developed by ad execs in the early 1900s to sell Morton salt. To this day, it is still one of the most successful advertising slogans ever written. 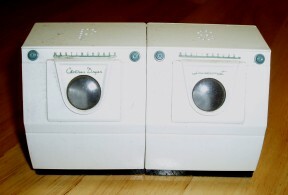 A washer & dryer set of shakers. Salt and pepper shaker sets came into being in the mid-1920s. By now, it was a habit to serve salt and pepper together, so it was only natural that they became a pair. The German fine pottery maker Goebel was one of the earliest producers of salt and pepper shakers and they introduced their first three sets in 1925. During the Great Depression many ceramics companies needed to concentrate on producing lower priced items in order to stay in business. Salt and pepper shakers were the answer. They were produced in many shapes, sizes and colors and could be purchased for just a few cents. Japanese ceramic companies also had a large share of the salt and pepper market beginning in the late 1920s through the 1950s, although production was halted during World War II. Shakers produced in the years following the war are marked “Occupied Japan” and are very collectible. •	There are two museums in the world dedicated to salt and pepper shakers: Gatlinburg, TN and Castell de Guadalest, Spain. Owned by the same collector family, the Luddens, they each house over 20,000 shakers. 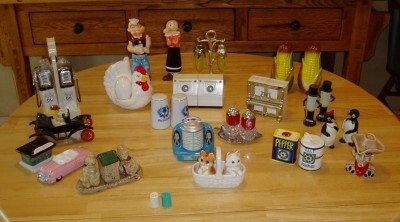 •	The Salt Shakers Collector Club started in 1983, but eventually split into two sections, antique and novelty shakers. As you can imagine, salt and pepper shakers are readily available today. New sets can be found anywhere and old sets can still be found at yard sales, second-hand stores, antique stores and your grandma’s cupboards, a great place to look for shakers while you are on vacation. In fact, this is probably how a lot of collections got started. A shaker set was an inexpensive gift or souvenir that could be easily tucked in a handbag or suitcase. Believe me, it doesn’t matter if you visit a famous place or somewhere very obscure–look for those odd little shops along the road (what my father termed “tourist traps”), and you will be able to find a salt and pepper shaker immortalizing the local attraction. Visit San Francisco and bring home a shaker set in the form of the Golden Gate Bridge or trolley cars. Visit Tombstone, Arizona and bring home a set of (what else?) tombstones. Visit the Everglades in Florida and score a set of alligators or a crate with two oranges. Visit the World’s Largest Hand Dug Well in Greensburg, Kansas…yep, you know what’s coming…a set recently sold for $39.95 on eBay! For those who are interested, check out the Novelty Salt and Pepper Shakers Club for lots of fun information and examples of collectible salt and pepper shakers. The club also hosts an annual convention–2013 will be in Las Vegas, July 18-20. 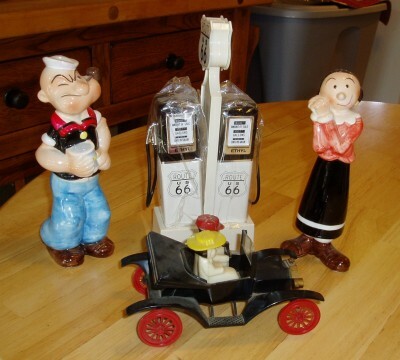 Some of Elizabeth's favorite shaker sets: Popeye & Olive, Rt. 66 gas pumps and a couple in a touring car. Elizabeth displays her favorite shaker sets in her kitchen and in a shadow box in her living room. At one time she had the majority of her sets displayed in a curio cabinet, but she and Bill have recently remodeled their kitchen, so she just keeps her favorites out. “I have the seasonal sets that I use-Thanksgiving (this set was given to me by my son when he was about 8 years old), Christmas and Halloween. Most of the others are just for show, ” she says. 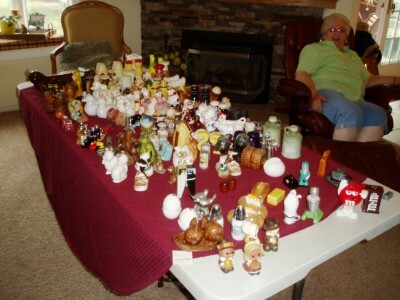 Elizabeth Angangan looks over some of her 300+ sets of salt & pepper shakers. Do you have a special collection, kitchen or otherwise, that you would like to share with our readers? Contact me via Kings River Life. Let’s spread the joy of collecting around. I noticed you have a wonderful collection of A Variety Of Salt and pepper shaker sets. Do you have a clientele that searches for specific shakers? 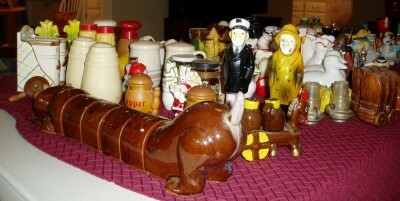 I have on my website, fromvintage2vogue.com several salt and pepper shakers that I have acquired from a customer. I am currently adding to the collection and posting about another 75. i was interested in learning more about the advertising circuits I should explore. Any suggestions?